OPAL brings together private donations, state and federal grants, low-interest mortgage loans, and countless staff and volunteer hours to make stable, permanently affordable housing available to qualifying Orcas residents whose needs are not met by the traditional market. How does homeownership work? Through an alternative ownership structure that enables OPAL to lower the initial price a home and keep that price affordable for future generations. The land is owned by the community land trust and leased to each homeowner, who must qualify for a mortgage to buy the house. OPAL commits to owning the land in perpetuity. OPAL acquires land with funding from private donations and grants; we also accept donations of land. An important part of our mission is to develop the land in an environmentally and socially responsible manner. In most cases, OPAL designs and builds the houses we sell. In some cases, existing houses – either purchased or donated – are renovated (and relocated if necessary). Design, construction, and renovation follow OPAL’s green building guidelines so structures are healthy, durable, and energy efficient. Applicants cannot have income and/or assets that would enable them to purchase a low-priced house in the traditional market. Applicants must be creditworthy and have lived in San Juan County for three years (not the last three consecutive years), unless there is no waiting list. 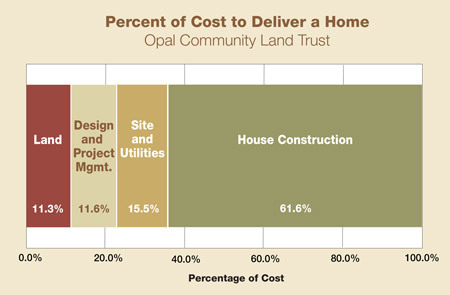 OPAL houses remain affordable for future generations. When an OPAL home is sold, the sales price is determined by a formula in the land lease. The formula is designed to balance equity gain for the owner at the same time that it sets a resale price that is affordable for future buyers. Read a brief description of how OPAL’s resale formula works. Community land trusts around the country use different resale formulas. The largest community land trust in the nation, Burlington CLT in Burlington, Vermont, completed a performance evaluation of its first 97 homes sold to new owners. The results have been published and presented in this Executive Summary.